Warning proximity of AC voltage (240V ~ 50kV). Easy to wear on Body, Belt, Helmet. Ultra high bright LED indication. Can be adapted to sunrise (stick). The Body-Prox 288 SVD is a Personal Safety Voltage Proximity Detector. 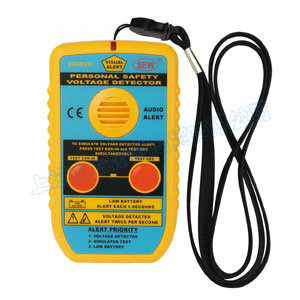 It is a designed to alert the user that they are approaching live equipment where dangerous voltage is present. The Body-Prox tells the user to stay at a safe distance from live equipments, therefore it protects and safeguards people from approaching dangerous Live High Voltage equipment or cable. Live Alert is shown by a ultra bright LED on the front panel and heard via a Buzzer. When Live equipment is detected near the user's body, the user will be alerted of the PROXIMITY OF LIVE equipment by the AUDIO ALERT (beeping) and the VISUAL ALERT (LED flashing) twice per second. The s88 SVD is an ultra low consumption product and can be used for months without replacing the 9V battery. It can be tested by pressing both front panel buttons to proof the tester is working properly. Should the battery become too low, a low battery indication will beep the buzzer and lit the led shortly every 5 seconds. The Body-Prox is water proof and can be used in all weathers. It has no voltage selection and the user does not need to know how to operate complicated test equipment. It is desinged to be simple to use. It only require to proof it's good working condition. This is done by simply depressing the two push buttons situated on the front panel. A very easy to understand "Priority Alert" Reporting System (Audio and Visual) lets the user know if an AC signal has been detected in the proximity (Buzzer and Red Light, Both "operates shortly twice per second"). Body-Prox, alert if battery is low (Buzzer and Red LED, both "Operates shortly every 5 seconds) per second". The 288 SVD consist of an internal pickup AC sensor plate, a test (oscillator) and diagnostic circuit, an adjustable threshold comparator, a souond annunciator (buzzer), a visual indicator (super high bright led) and a 9V battery, all enclosed into the robust "beeper" style case. The enclosure has a built-in clip to be able to be attached on the outer gaments / external clothing or belt. The 288 SVD detects AC voltages using it's internal AC sensor plate. The AC sensor plate pick up part of the radiated electric field in volts per meter (V/M). The electric field is amplified and processed by the internal circuitry and once the processed signal is above the threshold, triggers the input of a integrated circuit, which star the oscillator for the buzzer and led. The Buzzer beeps and Led lit intermittently at a rate of 2 beeps/flash per second. The "Self-test" diagnostic is actioned by depressing simultaneously both push button on the front panel. The battery monitoring is always ON. Please see the priority of alert on the front panle. It is recommended that when the 288 SVD is used in HV yards of mixed voltages : In the presence of mixed voltages, it could become difficult to determine exactly which source has been detected or which source created the alert. Alway treat all sources as LIVE.